7th & 8th graders at St. Joseph Consolidated School prepare for Confirmation with their Religion teacher during school. All students must receive this Sacrament at their home parish. They will participate in a retreat in their preparation. The St. Aloysius students have Confirmation at St. Aloysius Church, along with the PREP students. The St. Joseph, St. Julie Billiart and St. Peter Parish students make their Confirmation at St. Peter in Chains at the Cathedral in Cincinnati. Students from other parishes need to obtain permission from their pastor to participate in Confirmation with the St. Joseph students. 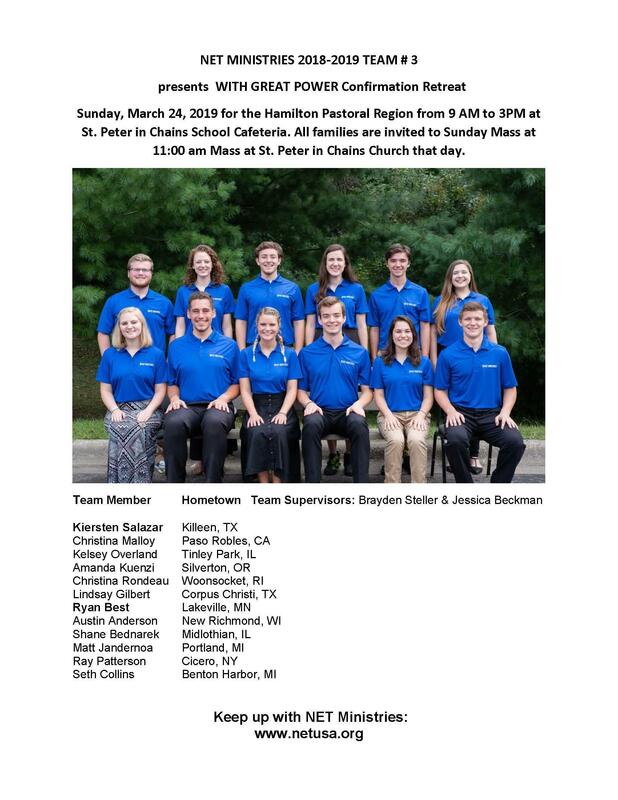 Mandatory Retreat Sunday 3/24/19 at St. Peters-Hamilton 9 a.m. to 3 p.m.
Confirmation- Sunday 3/31/19 at St. Peter in Chains Cincinnati 2:00 p.m.
Second grade students spend the year working and preparing to complete two very special sacraments- their First Reconciliation and First Eucharist. These sacraments are completed at the student’s home parish. Students prepare during religion class for this important day within the school day. The teacher will hold parents meetings regarding both Sacraments. First Reconciliation is held in December. Students will prepare daily for this along with a retreat held with parent assistance. Families are invited to also participate in reconciliation at the service. On the last weekend in April both St. Aloysius and St. Joseph parishes hold their First Eucharist Celebration. St. Aloysius at the 5:00 p.m. and St. Joseph at the 10:30 a.m. Mass. The students participate in the “Rite of Enrollment” during a weekly school Mass. Each family is responsible to make a banner to indicate their “family pew” which will be assigned by the teacher. The Jesus Day retreat is held the Thursday before the ceremony and also requires parent volunteers. On First Eucharist day the parishes have group and individual photos offered to the students. May Crowning is traditionally celebrated in early May in conjunction with a school Mass. This service includes both the eighth grade and the second grade classes. The eight grade students dress in “dress” clothes and the second graders wear their First Eucharist outfits. There is a court that crowns Mary made up of six eighth grade students (who are voted on by their peers and staff). After the May crowning the eight grade graduation photos are taken.